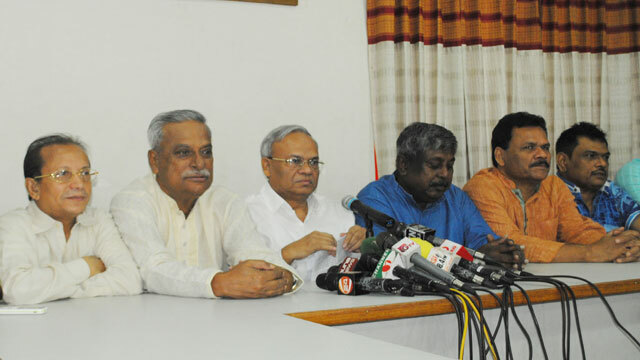 Dhaka, July 6 (Just News): The Bangladesh Nationalist Party (BNP) will stage demonstrations in the capital on Sunday protesting what the party said the denial of police permission for holding its Saturday's rescheduled rally in the city. Party’s senior joint secretary general Ruhul Kabir Rizvi announced the fresh programme at a press conference at its Naya Paltan central office on Friday, reports UNB. "Police have informed us that they will not give us permission to stage our protest rally in Dhaka city on Saturday. So, we’ll stage demonstrations in all thanas of the capital on Sunday in protest against it," he said. The party leaders and activists will observe a token hunger strike on Monday from 9:00am to 4:00pm either at the Institution of Engineers, Bangladesh or Mohanagar Natyamancha, demanding Khaleda's release from jail and her better medical treatment, Rizvi said. As part of the party's countrywide programme, BNP was scheduled to hold a rally in front of its central office on Thursday protesting at the Supreme Court order upholding its stay on the bail granted by the High Court to Khaleda Zia in a murder case filed in Cumilla. The party rescheduled the programme for Saturday after the Dhaka Metropolitan Police (DMP) had not allowed it to hold the rally.